After ForexMart sponsored the spanish football club UD Las Palmas, the relationship between the two organizations is now more successful than ever, with ForexMart being recognized by The International Finance Magazine (IFM) as the Best New Broker for Europe this 2016. ForexMart clients also enjoyed VIP tickets which allowed them to watch games of UD Las Palmas, therefore creating more marketing opportunities for ForexMart and Union Deportiva Las Palmas. Due to the football team's unprecedented hard work, Union Deportiva Las Palmas had a good debut season finish in Spain's top professional football league, capping off the said league with a significantly strong playing streak after a 13-year break. Because of this, ForexMart is looking forward to having more fruitful seasons with UD Las Palmas. Juan Valeron, the star player of UD Las Palmas, will also be retiring this year, and ForexMart has paid a fitting tribute to the football player's stellar career with Union Deportiva Las Palmas. 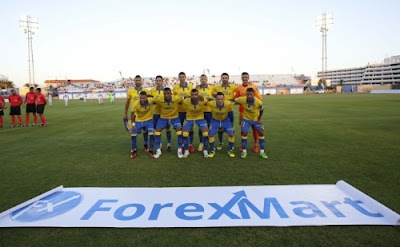 ForexMart became the official sponsor of UD Las Palmas last September 2015, with ForexMart stating that the brokerage firm believes in UD Las Palmas' ability to become a formidable team in the top division of La Liga, the strongest football league in Europe. After a year of partnership, ForexMart has expressed positive sentiments in a statement, saying that it is "very happy that ForexMart's partnership with UD Las Palmas has turned out well, and we at ForexMart are looking forward to a more strong relationship in the coming years with UD Las Palmas." ForexMart is a regulated in EU Forex Brokerage Firm based in Cyprus which specializes in high-tech online trading solutions. The firm specializes in online foreign exchange (currency) trading, metals marginal trading, and CFD trading. SMG are delighted to have brought the parties together.